One of the greatest war movies ever made is also one of the most visually and aurally stunning, so the news that it is to be released on UK Blu-ray in its original theatrical aspect ratio, and a wealth of extra features including Eleanor Coppola's extraordinary documentary Hearts of Darkness: A Filmmaker's Apocalypse has some of us here twitching with anticipation. Martin Sheen stars as Captain Benjamin Willard, a troubled man sent on a dangerous top-secret mission into Cambodia during the Vietnam war to assassinate a rogue Green Beret, Col. Kurtz (Marlon Brando), who has barricaded himself in a remote outpost. As Willard ventures deeper and deeper into the wilderness of the jungle, he embarks on a strange journey that leads him to Kurtz – but also forces him to come face to face with the terrifying vision of the heart of darkness in us all. With an all-star critically acclaimed cast that also includes Robert Duvall, Dennis Hopper, Harrison Ford and Laurence Fishburne, Apocalypse Now so impressed the Cannes jury when shown as only a work in progress that it won the Palme D'Or that year (tied with Tin Drum). Vittorio Storaro's stunning cinematography and masterful sound editing from Walter Murch won the film deserved Oscars and were just two of many awards the film has won over the years. This highly anticipated Blu-ray Disc premieres in 1080P High Definition Widescreen in a 3-Disc Full Disclosure Edition. Also for the first time, these movies will be presented for home entertainment audiences in their original theatrical aspect ratio of 2.35:1. The release will include Apocalypse Now and Apocalypse Now Redux with more than nine hours of bonus material, including new interviews with on-screen and behind-the-scenes talent, as well as the acclaimed making-of feature documentary Hearts of Darkness: A Filmmaker's Apocalypse. In addition, the set features a 48-page collectible booklet with a special note from Francis Ford Coppola, never-before-seen archives from the set, behind the scenes photos and more! The Full Disclosure Edition will be packaged in a keepsake case featuring archival poster images designed by Japanese artist Eiko Ishioka. 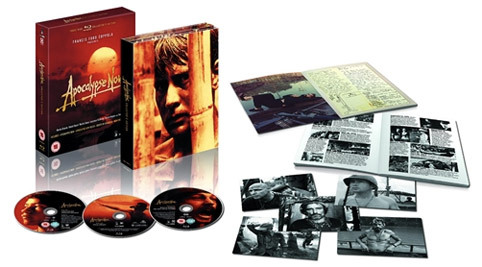 Apocalypse Now will return to UK cinemas, following extensive restoration by its director Francis Ford Coppola, on May 23rd, which will be followed on 13th June 2011 by the Blu-ray release of Apocalypse Now: Full Disclosure Edition at the RRP of £29.99. Both releases will be courtesy of Optimum Releasing. Marketing Archive: original trailer, radio spots, theatrical program, lobby card and press kit, photos.